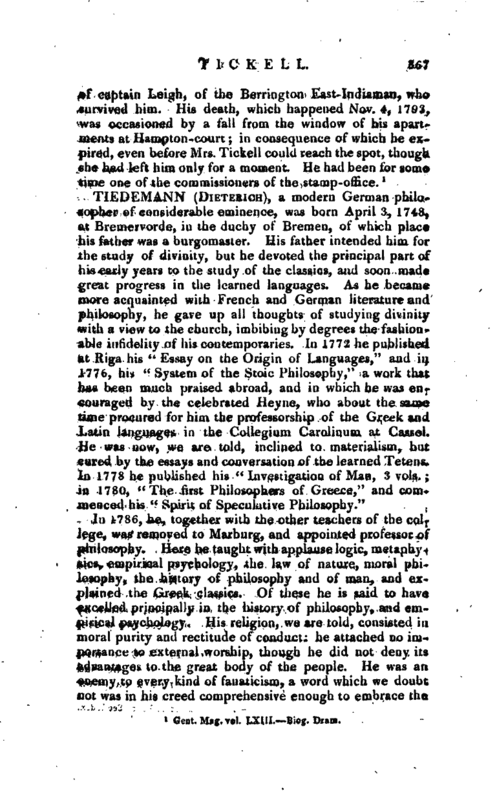 , an ingenious writer, who first appeared as an author about 1778, in a poem entitled, “The Project,” is supposed to have been a descendant of the preceding, or rather of his brother Richard Tickel), esq. who was appointed secretary at war in 1724, and held that post till his death in 1740. 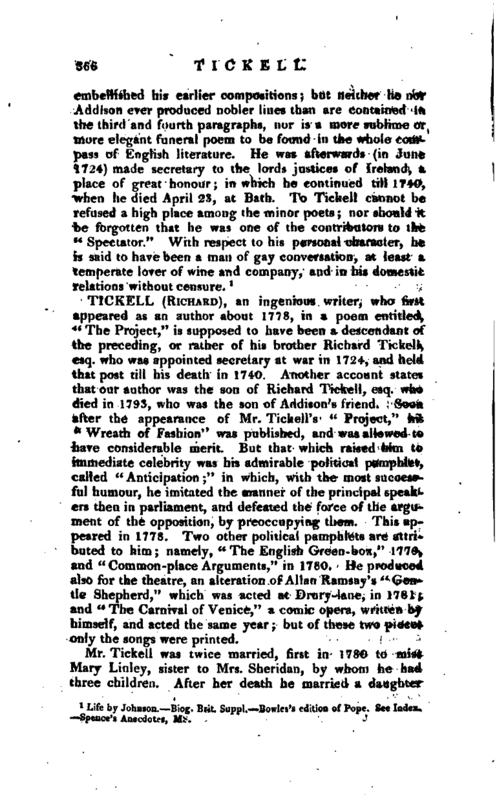 Another account states that our author was the son of Richard Tickell, esq. who died in 1793, who was the son of Addison’s friend. Soon, after the appearance of Mr. Tickell’s “Project,” his “Wreath of Fashion” was published, and was allowed to have considerable merit. But that which raised him to immediate celebrity was his admirable political pamphlet, called “Anticipation;” in which, with the most successful humour, he imitated the manner of the principal speakers then in parliament, and defeated the force of the argument of the opposition, by preoccupying them. This appeared in 1778. Two other political pamphlets are attributed to him; namely, “The English Green-box,” 1779, and “Common-place Arguments,” in 1780. He produced also for the theatre, an alteration of Allan Ramsay’s “Gentle Shepherd,” which was acted at Drury-lane, in 1781; and “The Carnival of Venice,” a comic opera, written by himself, and acted the same year; but of these two pieces only the songs were printed. Gent. Mag. vol. LXIII.—Biog. Dram.